Beatles Records & Memorabilia Merchandise is our specialty at www.Beatles4me.com. We take great pride in offering you a fantastic selection of Beatles Records & Memorabilia Collectibles, with well over 90% of our Beatles Records & Memorabilia collectibles being original from the 1960's. We Buy & Sell Original Beatles Records & Memorabilia. 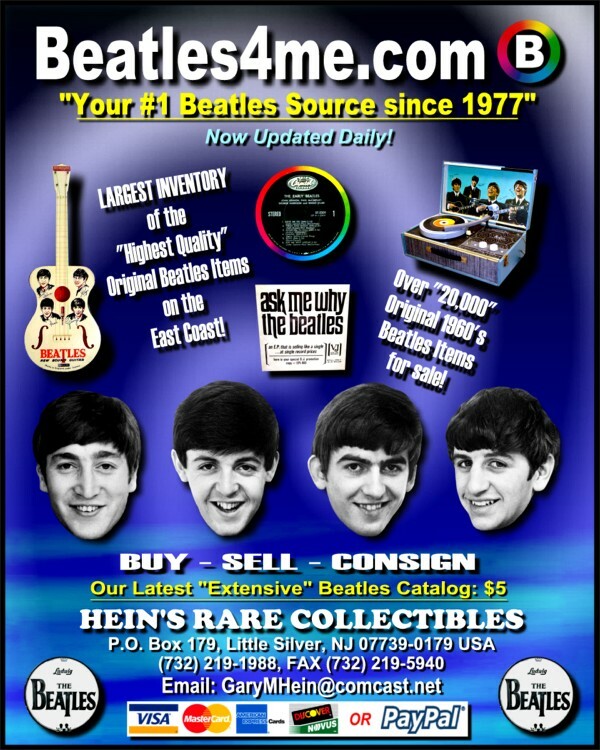 "Your #1 Beatles Records & Memorabilia Source since 1977"
All items offered here are 100% Guaranteed Authentic. www.Beatles4me.com is your "Safe Beatles Records & Memorabilia Website!" Click here to begin your "Magical Mystery Tour" of our "Extensive" Beatles Records & Memorabilia Website! Remember, we specialize in all Beatles Records & Memorabilia ephemera at www.Beatles4me.com. As time permits, we update our website with new Beatles Inventory as it is received. Also don't forget, we Buy & Sell Original Beatles Records & Memorabilia And Autographs. Click the link above and come see our "Extensive" Beatles Records & Memorabilia Website, where we list our Beatles Records & Memorabilia Ephemera!!! "You're #1 Beatles Records & Memorabilia Source since 1977"